1Basil Freshly torn leaves added to a sauce or atop a pizza, or when finely chopped with pine nuts, olive oil, and garlic for a fresh summer pesto, bring the taste of an Italian summer to any dish. 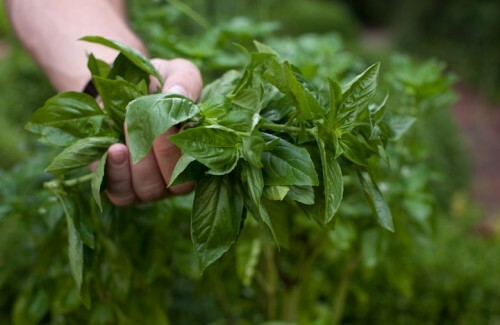 Is there any herb more associated with Italy than basil? 2Italian flat-leaf Parsley More tender and far more flavorful than its curly-leafed cousin, this parsley adds a garden fresh taste to many dishes and makes for an easy, appealing garnish. 3Thyme Sometimes the flavor of dried thyme can be too strong and, in summer when fresh thyme thrives in the garden, I like to use fresh thyme leaves quickly striped from their stems. 4Mint Where I live in the hot South, there is nothing more refreshing on a sweltering day than a glass of sweet tea with fresh mint—or a mint julep, with its kick of bourbon. In Italy, it is used with sweet dishes as often as it is used with savory ones. Zucchini paired with fresh mint is a knockout! 5Rosemary In Shakespeare’s Hamlet, the mad Ophelia says, “There is rosemary for remembrance.” And truer words were never spoke. Used in too great of a quantity, its strong, woodsy flavor can overwhelm a dish…and you won’t soon forget it. But when used with restraint, it can turn meat and pastries into something elegant. Some people think rosemary has a strong or soapy flavor—hmm, maybe that is why Ophelia ends up in the cold waters of the river? 6Oregano I would bet that most Americans think that oregano is the only herb Italians use in sauces, especially for pizza. It has been my observation that Italians use oregano with less frequency and much more restraint than we give them credit ~ the same could be said for the Italians use of fresh garlic. I tend to think of oregano as being a Greek herb, but Italians do use it ~ just not in every dish! 7Sage The sight of silvery green sage leaves in the herb garden makes me smile. Visually, the texture and color offer a different element and, if left to bloom, its tall spike of tiny purple flowers is a wonderful garden ornament. Of course, when used in cooking, sage is most often associated with poultry dishes, especially around Thanksgiving here in America. However, Italians put sage with rustic potato dishes and it is fantastic when simply paired with brown butter as a sauce for pumpkin gnocchi or squash-filled ravioli. Similar to rosemary, there is an earthy quality to the flavor of sage, but that doesn’t keep Italians from being creative with it. On a recent trip to Rome, I was served “garden sage and raspberry” gelato ~ WOW!